If you don’t like zucchini you should still try this recipe! You can’t taste the zucchini but it adds a lot of volume to these. Here is a picture of them before I put them in the oven. I have a picture after they are cooked, but I think steam got in my camera or something because the picture is all blurry. 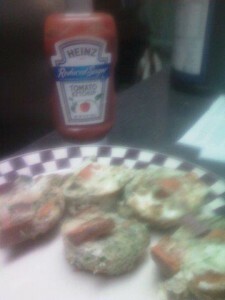 I love making mini frittatas! I feel so fancy when I eat them, haha. These are awesome if you want to have a “brunch,” or if you have guests over. These are fun bite-size snacks that everyone will love. Anyways… these were pretty easy for me to make because I precut and cooked a lot of the ingredients that were in this recipe. But, this is a really great meal to make on the weekends if you have a little extra time. Learn how to make these frittatas below! I hope you love them as much as I do. I bake a whole bunch of sweet potatoes at once, cut them in half, and just keep them in Ziplock baggies in the fridge, so when I need a quick carb, it is ready to go. I just used two of those sweet potatoes halves in this recipe. My potatoes were already cooked, but if you didn’t have pre-cooked potatoes handy you would want to cook them first. Cook them at 400 degrees for 30 minutes. 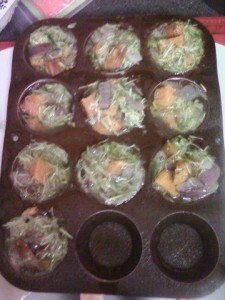 Preheat oven to 400 degrees and spray a muffin tin with non-stick olive oil spray. 1. First, sautée the onions for one to two minutes using non-stick olive oil cooking spray until they are a little soft. 2. In a medium bowl, mix the egg whites, sweet potato chunks, sautéed onion, grated zucchini, and spices together. 3. Use a small measuring cup to spoon the mixture into the tins (might be a little messy because the eggs whites sort of goop together sometimes). With this recipe, you should be able to fill 8-10 tins (varies depending on the size of the potato, onion, zucchini, and depth of tins). Wipe off any extra egg whites on the pan and cook for 25 minutes. Four to five mini frittatas is one serving. Those who know me, know that I love ketchup on pretty much anything, so I also used some reduced-fat ketchup on the side. Really good and filling! A nice changeup to regular old eggs.